3 Bedroom Detached House For Sale in Chorley for Asking Price £210,000. This modern three bedroom detached property has the benefit of being on offer with no chain and is well worth taking time out to view, located on the ever popular development of Buckshaw Village within a short distance to the main hub where you will find local amenities including pubs, super markets and the local school. The property itself is well presented and briefly comprises entrance hallway, ground floor cloaks/Wc, dining room, lounge with French doors opening to the rear garden and fitted kitchen. The first floor consists three bedrooms with master having a three piece en-suite and separate family bathroom. Externally there is a rear enclosed garden, driveway providing off road parking and direct access to the detached garage. Double glazed entrance door, stairs leading to the first floor, coving and storage. Two piece suite comprising low level Wc, wash basin, Upvc double glazed frosted window, tiled to compliment and radiator. Upvc double glazed window, radiator and ceiling coving. Light and airy reception room with Upvc French doors to the rear garden, Upvc double glazed window, Fire with feature surround, ceiling coving and radiator. Fitted with a range of wall and base units with contrasting worktops, integrated oven and hob, space for other appliances, sink and drainer with mixer tap, tiled to compliment, radiator and Upvc double glazed window. Master bedroom with radiator and door to en-suite. Fitted with a three piece suite comprising walk in shower, low level Wc, wash basin, tiled to compliment and Upvc double glazed frosted window. Walk in storage, radiator and Upvc double glazed window. Fitted with a three piece suite comprising panel bath with over head shower, low level Wc, wash basin, radiator, tiled to compliment and Upvc double glazed frosted window. 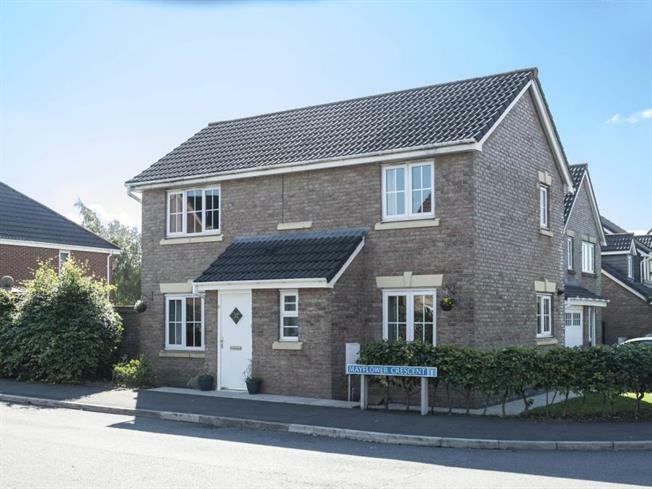 Externally there is a driveway proving parking with access to the detached garage and an enclosed rear garden with laid lawn and paved patio area. Power and lighting with up and over door.